Experience worldwide VPN protection from hackers, data espionage and other online snoops. With mySteganos Online Shield VPN, you can browse the web safely and with maximum anonymity - whether at home, in the office or on the go. 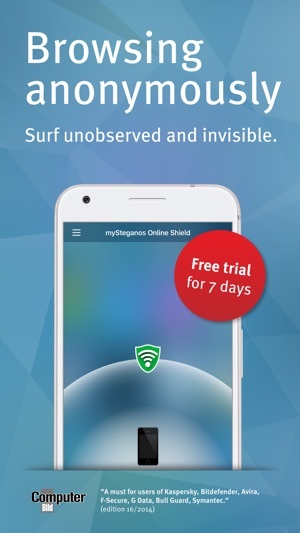 mySteganos Online Shield for iOS is a reliable and advanced VPN solution without ads. Try it out for yourself using the 7 day trial. 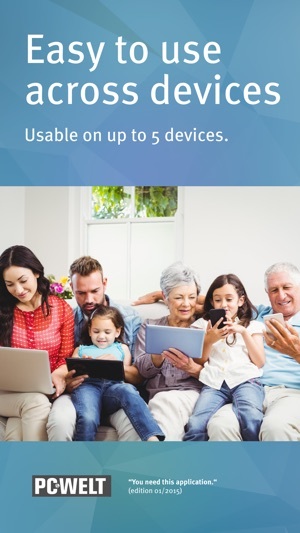 Why choose mySteganos Online Shield VPN for iOS? 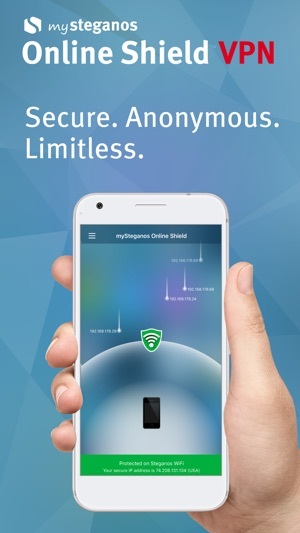 Whether passwords, emails, photos, payment or bank data - mySteganos Online Shield VPN protects your private and business data from hacking and snooping. Even outside your own four walls, for example at the airport, in a café or hotel - with mySteganos Online Shield VPN you can even use public Wi-Fi hotspots safely and anonymously. mySteganos Online Shield VPN creates so-called virtual private network (VPN) that encrypts all your traffic. Your real IP address will be exchanged for a random IP address from the huge Steganos pool. So your original IP address and digital identity is completely protected. The use of mySteganos Online Shield VPN is independent of your location. So you can browse the Internet in Wi-Fi hotsports and wireless networks (3G, 4G, LTE, GPRS, EDGE, etc.). 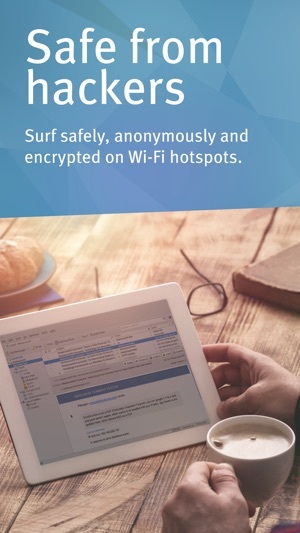 Thanks to VPN encryption of your Internet connection, you are tap-proof and anonymous in public Wi-Fi. The amount will be paid using your iTunes account. The subscription will be automatically renewed if it hasn't been cancelled at least 24 hours before the current subscription period will expire. Your iTunes account will be charged with the amount for the new subscription period within 24 hours before the current subscription period will expire. You may cancel your subscription in the iTunes account settings at any time. Once a subscription has started the amount for the current period can't be charged back. Any unused portion of the free trial period will be forfeited when purchasing a subscription.